Two young novice monks standing on a verandah in a monastry in Myanmar (i.e., Burma). 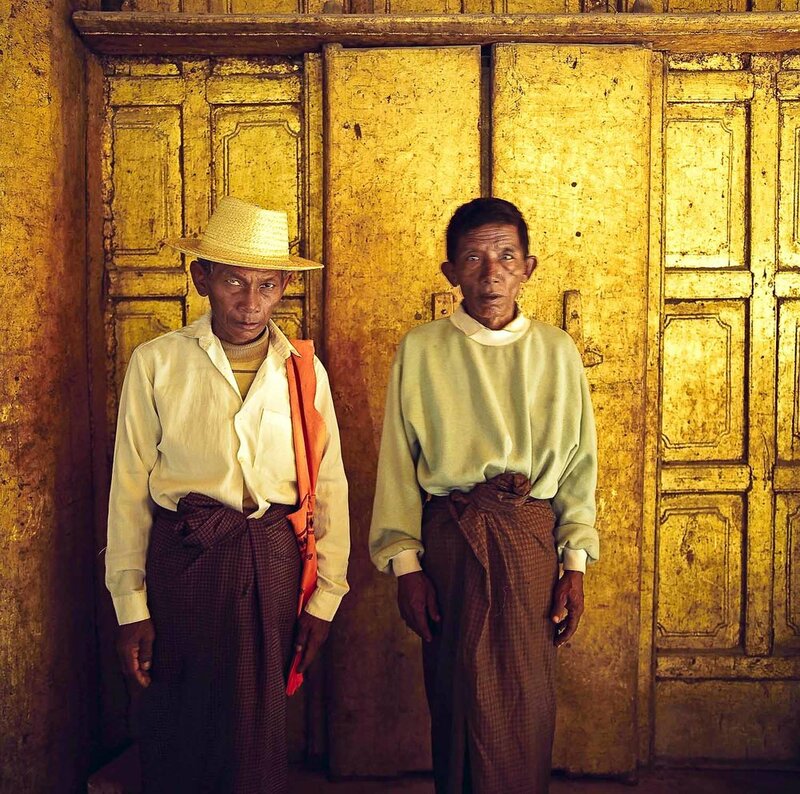 The above image features two novice monks in Myanmar. While their maroon robes were beautiful to behold I feel this black-and-white rendering illustrates the innocence and purity we associate with younger folk. I made the photo in the grounds of a Buddhist temple on a hot, bright day in December 1999. I’m planning to run a special photography tour to Myanmar in around 12 months time. The common perception is that bright, sunny days provide the ideal weather for photography. Nothing could be further from the truth. Bright, direct light reflects off the surface of the subject taking with it much of the subject’s color and texture. Imagine an expensive bride’s dress rendered as a big white blog in a photo. No, that wouldn’t be good. Now take another look at the photo at the top of this post. Notice how so much of the texture in the novices robes has been retained by moving them out of the bright sunlight. Other problems associated with making portraits under bright, direct sun is that it produces shinny, specular highlights on the subject’s forehead and deep, black shadows under their eyes. Once permission was given for me to photograph the two young novices I moved them onto a well shaded verandah. I then spent quite some time positioning them to make an interesting composition that allowed the light to feather across their robes and illuminate their faces. I’m normally very quick photographing people, particularly strangers. But this was a very tricky image to get right and I was lucky to be photographing such patient young boys. Desiring a somewhat candid feel I gave very specific instructions for where I wanted the boys to look. This was a very difficult image to produce but, given the pretty average quality of the scan, the result is one with which I’m very happy. All of the images in this post are from the same body of work which came out of an extensive trip to Myanmar, Laos and Tibet. I remember going to bed very early on New Years Eve 1999. I was ill and in the temple town of Luang Prabang in Laos and the Y2K bug, which was rumored to wreak havoc across the world, was only hours away. Well, we survived that one. In those days I’d print all my medium format work, in a high tech darkroom at Kodak, as 16 inch square prints which would be matted and framed for exhibition. I’d finished up at Kodak 18 months earlier but, through the kind support of a former colleague, was granted access to an excellent darkroom with it’s wide roll Autopan processor. Thanks Boff. The photographic paper would be exposed in the darkroom and then feed into one end of the machine where it would travel, through various chemical and water baths, prior to coming out, washed and dried, at the other end about 4 minutes later. I was so glad to be freed from rocking trays and processing drums/tubes. Oh yeah! I’d done my time in the kitchen at parties. Fisherman on Taungthaman Lake near the town of Amarapura in Myanmar (i.e., Burma). While not always easy to work with I loved the unbiased nature of the Hasselblad camera’s square format. With the square format it’s not so much the bias imposed upon the image by the orientation of the camera, but the elements within the frame that emphasize notions such as movement, energy, stability and harmony. Would you like to see more great people based photography you’ll find it here. The images in this post are very old, going back to December 1999. The original color negatives was scanned back in the early 2000’s then processed in Adobe Photoshop. One day soon I hope to re-scan and re-process these images to better bring out their communicative potential.